The FeedWind widget supports a number of different scroll options, with the ability to scroll vertically or horizontally. 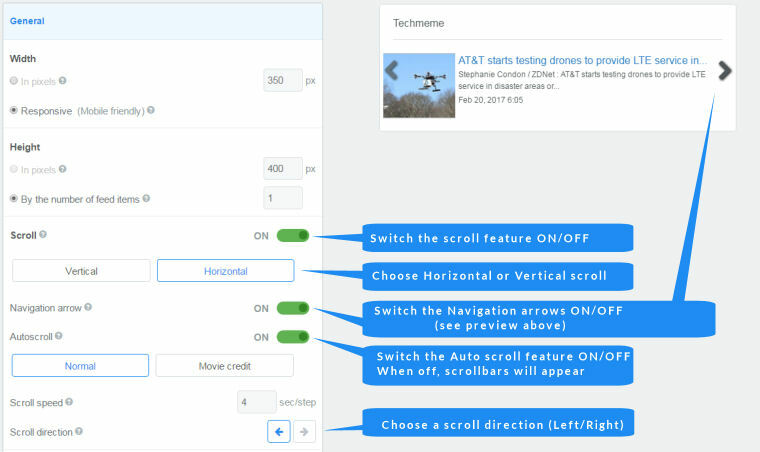 There are options to choose autoscrolling, enabling and disabling the scrollbar and The default scroll direction is vertical but you can switch to horizontal scroll as required. Please see below for the various options available for horizontal feed scroll and vertical feed scroll. Horizontal scroll for your feed is also known as slideshow format or marquee (ticker tape) scroll. The combination of settings we have provided should work for most applications where horizontal scroll of your RSS feed widget is required. To make horizontal scroll RSS widget, simply open your widget in the setup screen (or create a new one) and change the setting from Vertical (default setting) to Horizontal. The setup screen will change to offer you further options specific to this scroll direction. You can also choose a Scroll speed in seconds per step for Normal mode; in Movie Credit (automatic/continuous scroll) mode, you can select the scroll speed. You can choose to hide/display the Navigation arrows which appear to the left and right of the widget, allowing users to scroll back and forth through your RSS feed. When enabled, the navigation arrows are hidden from view until the user hovers the mouse over the widget. You can still use the height/width controls and create a horizontally scrolling RSS widget which can display a single or multiple feed items in a slideshow format. A vertical scroll RSS widget is the default option so unless you already chose a horizontal scroll RSS option, you will not need to change this. When the Vertical option is selected, your widget will scroll upwards/downwards depending on your selection of the Scroll direction option. 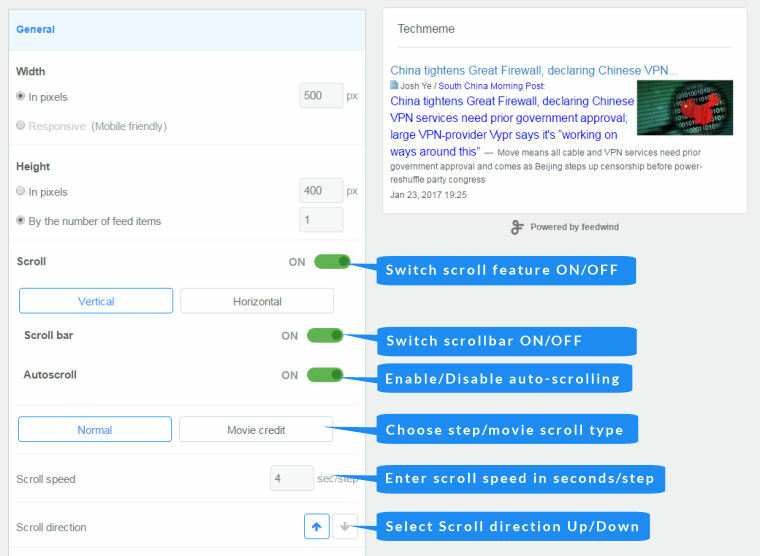 You can also choose a Scroll speed in seconds per step for Normal mode; in Movie Credit (automatic/continuous scroll) mode, you can select a scroll speed from Slow, Normal,Fast. You can also display/hide the scrollbars, giving you a very flexible choice of scrolling options for your RSS or Facebook widget. The FeedWind RSS widget has an automatic scrolling feature to make it easier for users to navigate your RSS widget. When the HTML button is “ON” and Autoscroll “OFF”, there is a manual scrollbar automatically added which is visible all the time. If you select Autoscroll to “ON”, the widget feed content will automatically scroll up/down and the widget will auto-scroll to the end of the current item list and then start again in an infinite loop, depending on your preference. In autoscroll mode, the scrollbar will become visible on mouseover. In addition, when the feed is autoscrolling, the scroll action will stop whenever the cursor is hovered over the widget container. Movie scrolling is intended to imitate the type of movement typically seen in movie credits which continuously scroll upwards or downwards. Movie credit autoscroll mode allows you to choose one of the 3 scrolling speed options: Slow, Normal and Fast. The ‘Normal‘ setting is a stepped scroll whereby each item scrolls quickly and stops for the number of seconds set by the user in the “Scroll step” setting. The longer the feed article or item, the longer this setting needs to be in order to allow the user enough time to scan/read the item.